File Menu: General operation controls. 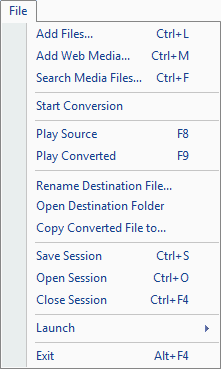 Add Files: Add media files to the conversion list. Add Web Media: Download video or audio files from any web page and convert them, if required. Search Media Files: Select a folder from local drive or network location and specify file formats to search. Start Conversion: Start conversion will toggle with stop. Select this option to start the conversion of selected files. Play Source: Plays the selected source file. Play Converted: Plays the converted file. Rename Destination File: By default, application uses the source file name. If you want to rename the converted file name then use this option. Open Destination folder: Opens the folder location where the converted files are stored. Copy Converted Files to: Select the converted file(s) and copy them to different location. Save Session: When converting files, you can save its current state in a Session. The current state consists of the files added for conversion, the status of the files (Pending, converted, aborted, failed) and the conversion settings such as the audio and video properties. Open Session: Open the saved session and resume the conversion where you left. Close Session: Close the existing session to start a new session. Launch Menu: Launch other DeskShare applications. Exit: Stops all the running actions, preserves the previously selected settings for the next use and closes the application. Edit Menu: Common file management features. Select All: Press Ctrl + A to select all the files from a particular recording folder. Unselect All: Unselects all the selected files. Remove: Remove selected file from the conversion list. Remove all: Remove all the files added in the conversion list. Format Menu: Player controls to view the screen recordings. Select Standard Formats: Select standard video (WMV, AVI, MOV, MPEG, 3gp etc) or audio (MP3, WAV, WMA, AAC etc) conversion format. Select Device Profiles: A wide range of devices are supported for the playback of your converted media files. Select your device if present in the available output formats. Tools Menu: Change the view of your recording and even sort them by using different ways of sorting. Video Effects: Adjust the video effects like brightness, contrast, and apply them in the converted video file. Split File: Remove the undesired portion of video or audio file and add only the required segment in the conversion. Create Playlist: Add audio files to create a playlist. Audio files will be played in a sequence in which these are added in the Playlist. Rip Audio CD: Rip your audio CDs to MP3, AAC, WMA, WAV, etc. Attempt to Repair File: The tool can repair the corrupted headers of AVI files, retrieve video data from MPEG files. It can correct problems occurring in QuickTime MOV files and repair corrupted WMV or WMA file which is not seek-able. 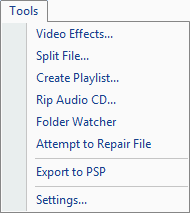 Export to PSP: Convert and transfer video files from your PC to the PSP device and copy PSP MPEG-4 files located on your PSP device to your computer. Settings: Configure the general application settings.